Don’t fear the terminal. No, really. 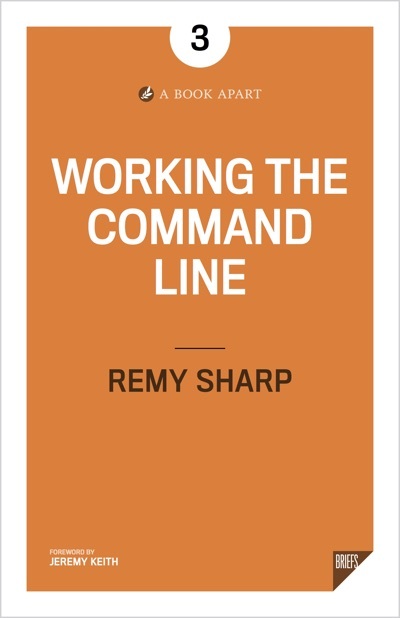 However you’ve wound up face to face with the cool glow of a terminal window, Remy Sharp is here to help. Gain command-line shortcuts and processing techniques, install new tools and diagnose problems, and fully customize your terminal for a better, more powerful workflow. Briefs are eBook-only guides to essential fundamentals, of-the-moment techniques, or deep nerdery on a single aspect of a topic. Whatever the book, you’re only a quick break away from learning vital, practical know-how. You can't build websites these days without using command-line tools—something many of us still find strange and scary. Fortunately, Remy Sharp is here to help. From the basics of piping commands together to tricking out your prompt, this book is a great introduction to terminal basics. It’s full of tips and tricks to help beginners—and even an experienced hand like myself—learn to become more confident and productive. The command line can be a quick, expressive, and effective way to accomplish many tasks. It's also very friendly; it just waits for your commands and only does what you tell it to. The problem is that many learning materials are not approachable for people with zero command-line knowledge. With this book, Remy offers you a way to discover a new world of productivity. This book is perfectly titled. The command line is intimidating and difficult, but Remy walks you through it, acknowledging that it can be both of those things while using humor and grace to show you how powerful it is. I’m more confident working with the command line having this book by my side.